Johannes Göbel was born June 3, 1856 in Norka, Russia, the son of Johannes Göbel (born 1822) and Katharina Elisabeth ? (born 1820). In late 1878 or early 1879, Johannes married Elisabeth Bauer who was born August 9, 1857 in Norka. Elisabeth is the daughter of Johann Georg Bauer (born 1833) and Katharina Elisabeth Blüm (born 1832). A daughter, Christina, was born on November 10, 1879 in Norka, and a second daughter, Sophia, was born in Norka on March 29, 1890. Johannes (John Gabel), Elisabeth (Lizzie), Christina and Sophia immigrated to the United States arriving in Baltimore on June 4, 1890 aboard the steamship America which sailed from Bremen, Germany. The Gabel's may have briefly stopped to visit friends and family in Nebraska, but soon departed for Oregon where they settled in Albina by late June. John heard that there were good work opportunities in Portland and quickly found work laying tracks for the street car lines and constructing the city water reservoirs in Washington Park and on Mt. Tabor. In 1891, the family was living at the head of San Antonio street (now NE Graham Street). John and Lizzie were members of the Ebenezer German Congregational Church founded in 1892. Christina married Adam Heinrich Gabel on January 22, 1899. They lived very near John and Lizzie on NE 6th Avenue. In 1900, John, Lizzie and Sophia are living at 308 Sacramento (now 60 NE Sacramento Street) and John is working as a yard hand at a local saw mill. In 1910, John, Lizzie and Sophia are living at 793 E. 6th Street North (now 3733 NE 6th Avenue) and John is working as a laborer for a street car company. The 1920 census shows John, Lizzie and Sophia living at 793 E. 6th Street North and John is working for the city water works. 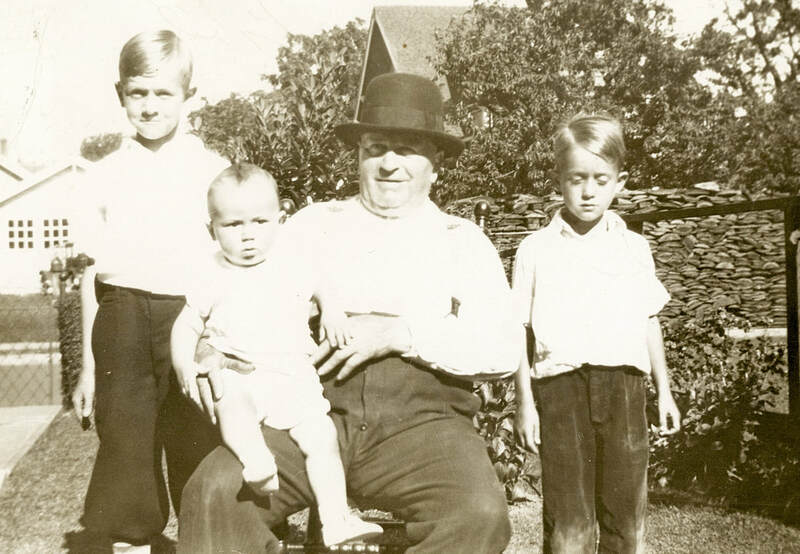 John Gabel with great-grandsons William John, Jr. Robert George, and Clarke Eugene (seated on John's lap), circa 1933. They are the children of John's grandson, William John Gabel and Mary Elizabeth George. Courtesy of George Gabel. 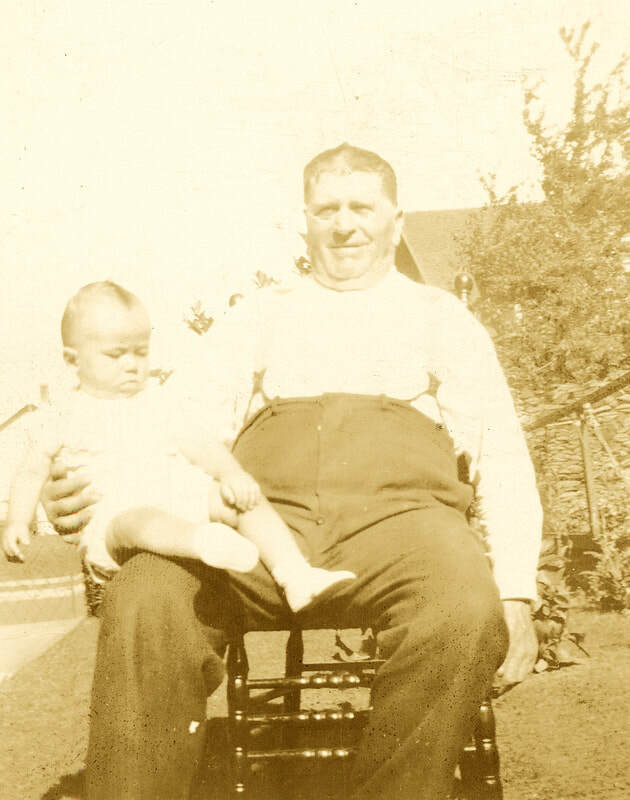 John Gabel and his great-grandson, Clarke Eugene Gabel, circa 1933. Courtesy of George Gabel. Lizzie died on January 16, 1923 and was buried at the Rose City Cemetery in Portland. John married a second time to Christina ? from Canada on April 12, 1924. In 1930, they are living 793 E. 6th Street N. Their neighbors are John Gabel (relationship unknown) and Heinrich and Dorothea Döring. John died on August 23, 1935 and is buried with Lizzie at the Rose City Cemetery.